There's no worse feeling in the world than pulling up to a stop sign or traffic light here in Westbury and feeling your car struggle to come to a halt as you press down on the brake pedal. Despite this fact, far too many drivers across Long Island still put off needed service and repairs on this front, which in turn leads to an increased potential for accidents and other, entirely avoidable, automotive calamities. Fortunately, if you'd rather not travel down this path and instead take proper care of your favorite Toyota vehicle as its brakes pick up routine wear and tear over the years, our service team here at Westbury Toyota has your back – and the years of experience repairing and replacing brakes needed to keep you and your family safe. With this in mind, let's spend a few minutes learning a little more about the five major signs that it's time for new brakes on your car and how best to handle this issue should you be experiencing any of these symptoms. As the editorial team over at GEICO explains, one of the most obvious signs that your brakes need some work is the emergence of a loud or unusual noise. There are a couple of different sounds you might hear, and those different sounds can be an indicator of just how severe the problem is. The most common sound people tend to hear though is a high pitch squealing or screeching. Most brake pads have a built-in system that denotes wear by a sharp noise, so you can count on this particular indicator to let you know that it is well past time to bring your car, truck, or sport utility vehicle (SUV) in for a service and repair session at Westbury Toyota. Going a step further, squealing isn’t the only sound that can come forth from failing brakes; you may also hear clicking or grinding noises every time you press down on the brake pedal. 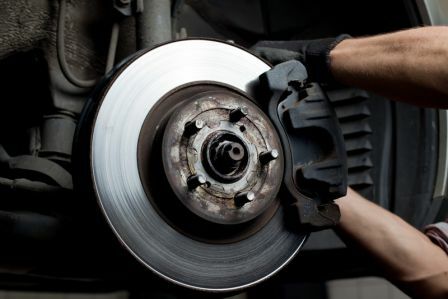 Generally, a loud grinding noise means that your brakes are experiencing metal on metal scraping and are in dire need of replacement, while a clicking noise whenever you brake is usually indicative of the fact that your brake pads need some attention. Either way, it’s safe to say that if you’re hearing an odd noise every time you brake while driving, you need to get your car in for an inspection as soon as possible. A sure sign that your car’s rotors are shot is a vibration that begins when you start to brake. Damaged rotors often come from extended periods of hard braking in situations like towing for long distances or frequently driving down steep hills. This kind of repeated braking can actually warp the brake rotors, which in turn means that the brake pads don’t function as they should. 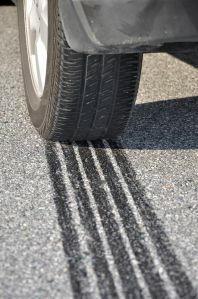 As soon as you notice a vibration when you’re braking, we recommend that you take immediate action and address problem. Otherwise, you'll surely have to face down a much more destructive – and costly – brake-related headache later on down the road. Most people mistakenly think that a delayed slowing response is the only indicator you need to be on the lookout for when it comes to problems with brakes, primarily because it is often the most apparent symptom. While you know by now that this isn't always the case, if you apply the brakes and it does take more time than usual for your vehicle to stop, it’s probably because of one or two things, explains Jeff Youngs of J.D. Power: A brake fluid leak, or an air leak in the brake hose. If it’s a leak with brake fluid, you may be able to spot it by checking underneath your car to see if there’s a puddle of liquid. Brake fluid can look similar to motor oil, but is generally less "oozy" in appearance. In the event of either kind of leak, it’s best to address the problem sooner rather than later. Brake pads don’t always wear down evenly on both sides of a vehicle. Should you find that your car pulls off to one side during the act of braking, it usually means that the brake pads on that side have worn down more than the others. Ignoring the problem can add unnecessary stress on other vital parts of your vehicle, such as the wheel bearings and ball joints, which in turn can lead to further issues and avoidable repair costs. Additionally, pulling to one side can also be indicative of other problems, such as a faulty brake caliper or tire pressure that’s uneven. Don’t write this issue off as something unimportant – if your car starts to pull to the side, it’s time to get it checked out! What Should You Do If You’re Experiencing These Issues? It’s important to pay attention to anything your car does that seems out of the ordinary. Strange noises, vibrations, and slow responsiveness are likely signs that something is going wrong with the brakes. Even if it seems like nothing more than a minor issue, J.D. Power's Young goes on to point out that ignoring or delaying brake service is a great way to increase the likelihood of costly additional repairs or an unfortunate collision with another driver on the streets of Westbury and Long Island. From this perspective, it makes plenty of sense to give any brake problem you might currently be facing down its due and taking care of this hassle before it morphs into a major issue. Otherwise, odds are that you will find yourself dealing with a plethora of brake-related headaches down the road that could have easily been avoided with the proper service and maintenance.